Description: Normally a dusty outback outpost with the feel of a pioneer town, ‘the Alice’ explodes with bellydancing, bands, rickshaw rallies and, most importantly, camel races in July. 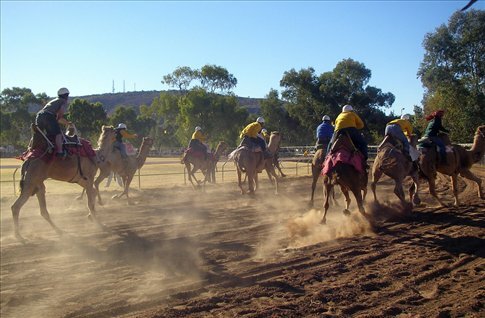 Camel racing may sound a trifle surreal to anyone not acquainted with the Northern Territory, Australia’s least-populated area. The sport’s appeal lies in the beasts’ unpredictability and irascibility. They snarl, guern, bite, and can spit more than 3m. At the start of a race, they might stay right where they are or even reverse, while when they get going at full tilt, jockeys have to do their utmost to stay astride. Held at Blatherskite Park, part of the Central Australian Show Society grounds, the desert extravaganza offers all sorts of trophies in addition to the main Imparja gong. The Afghanistan Cup is presented by the country’s ambassador to Australia, commemorating the 19th-century Afghans who brought camels to the outback and constructed telegraph lines and railways. In the Honeymoon Handicap, ‘grooms’ race half way around the arena before halting, lowering the camels, and handing the reins to their ‘brides’. If a couple is feeling particularly cocky, they might also fancy their luck in the Miss & Mr Camel Cup Challenge. Tykes and ungulates can compete in the hobby camel capers and the Prettiest Camel contest. Local Attractions: Uluru, the famous red rock, is southwest of Alice.